This is College Physic Answers with Shaun Dychko. Here is the picture we had in problem 16 and problem 19 here we're going to change it by having vector B go downwards instead of upwards. So this resultant which we're going to call R prime to distinguish it from R in problem 16 is going to be directed down like this and so we expect it to be equal to A minus B. We have minus B here because it is, this vector is in the opposite direction to what it was before and putting a minus sign in front of the vector makes that happen. It makes the vector change directions. Okay. So the x component of our resultant will be the x component of vector A plus the x component of vector B. Vector B has no x component and so it simplifies to just vector A which is entirely in the x direction. It is going negative 18.0 meters, negative because it is directed to the left and the right is positive. For the y component of the resultant, we have the y components of the other vectors together of which only B has a y component. It is going downwards, that's why the negative is there, 25.0 meters. The magnitude of the resultant is going to be the square root of the sum of the squares of its components. So that's the square root of negative 18 meters squared plus negative 25 meters squared, giving 30.8 meters. Its direction will be the inverse tangent of its y component divided by its adjacent x component. When we do our inverse tangent, we're going to be finding this angle in here. This angle is directed to the south of west. So we have inverse tangent of 25 divided by 18, giving us 54.2 degrees south of west. 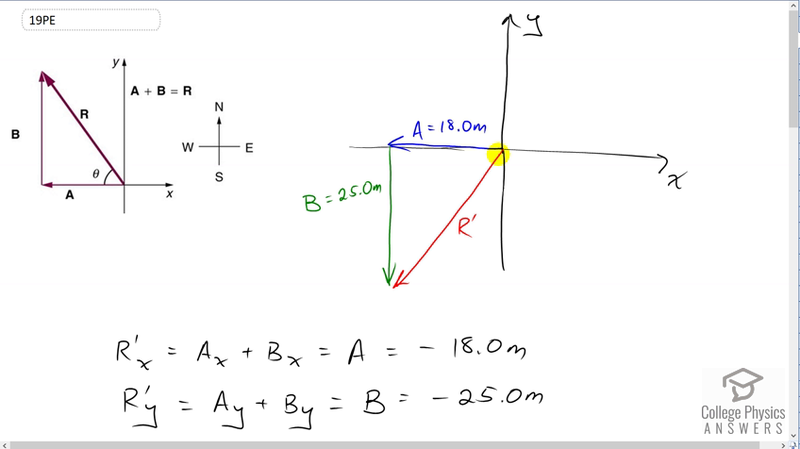 So our final answer for the R prime vector is 30.8 meters, 54.2 degrees south of west. In part B, it says to first go 25 meters upwards and then go 18 meters to the east and then find the resultant here. We'll call that R double prime. This is -- both of these are in the opposite direction to what they were in part A. Vector A is now going to the right and vector B is now going upwards. Okay, and so we expect R double prime to be the opposite of R prime. We expect our answer for part B to be in the opposite direction to our answer in part A. If it is, then we'll say that part B is consistent with part A. By the way there's a bit of a typo in the question in the textbook. It says, "That is to find A equals B plus C" but that doesn't make any sense 'cause there is no vector C. So what they really meant to write there instead is to say that R double prime is B minus A, the opposite of what R prime was. Okay. So process is the same for part B as it was for part A and as it is for any adding vectors question with an analytical method, we have R double prime x component is the x component of the vectors added together. But only vector A has one so it's 18. The y component of this resultant is 25. Add the squares of the components together and then take the square root of that sum and you get 30.8. The angle, inverse tangent of the y over the x, gives 54.2. So these numbers are all the same as we had before. The only difference is this interpretation, where we're finding this angle in here. By the way it's not this angle here because I did the inverse tangent of the y component which is here, divided by the x component. Okay. If we had done inverse tangent of the x component divided by the ycomponent, then that would have found this angle in here, But that's not what we're doing. So we have 54.2 degrees north of east and we have confirmed that part B is consistent with part A since this is the same as this, only instead of south of west, which is down into the left, we have north of east which up into the right. So, yeah. Part B is consistent with part A and we've shown that R double prime is the opposite of R prime.